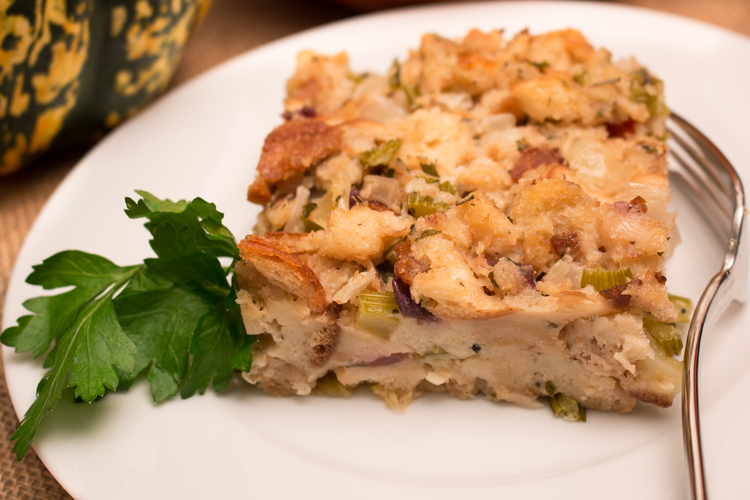 A basic stuffing is made of toasted bread, broth, and vegetables. From there you can get creative and add what you want. Italian sausage and herbs, apples and craisins, or try pancetta, chopped dates and goat cheese. Add chopped nuts for additional texture. Stuffing is something that can easily be adjusted to accommodate a variety of guest dietary needs. 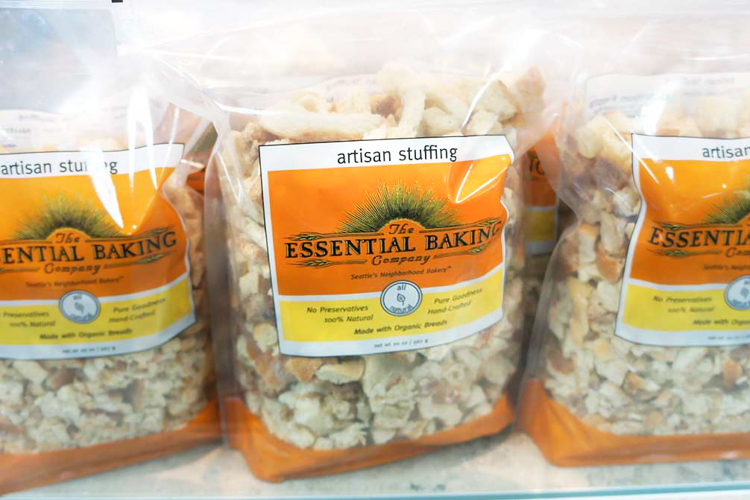 1 – 20 oz bag of our Artisan Stuffing or 1 lb. of one of our artisan loaves or our gluten free bread cut it into 1/2 – 1 inch cubes, that have been toasted in a 325 degree oven for 30 minutes, or until crisp and lightly browned on the outside. In a saucepan or cast iron skillet, add 1 tbsp. extra virgin olive oil over medium heat. If using meat, add now. Cook and then set aside in a large separate bowl. In the same saucepan or skillet, add onions, garlic, celery, carrots, spinach, rosemary, thyme, sage and parsley. Cook until vegetables are softened. In the large bowl, toss well to coat and combine the meat (if using), sautéed vegetables, bread pieces, parmesan cheese, broth and eggs; add more broth if needed to moisten the bread. Transfer mixture and press into a baking dish that’s been prepared with your choice of non-stick and cover with foil. Bake covered with foil at 350 degrees for 30 minutes. Uncover and bake 10 minutes longer or until the top is crisp and golden brown. Save Now For The Holidays! Watch us 11/11 on QVC!